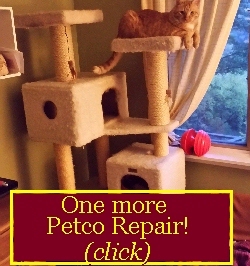 First EVER sale on replacement parts for your Chinese made Cat Tree! Buy any 2 columns, and receive the 3rd* for HALF OFF. Discount will be applied as a refund after you make your purchase at regular prices. & will be confirmed by e-mail. *1/2 price third column needs to be at equal or lesser value. Expires 4/30/19. Shipping costs will be combined for your purchase & will be adjusted accordingly. 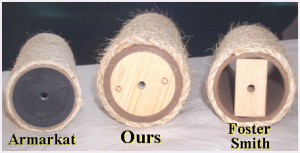 High quality sisal rope columns ( posts ) to fit many brands of cat trees. Carpeted columns may also be special ordered (Contact Us). Any item that isn't a column (other components for other brands). Feline Design's Post - center. 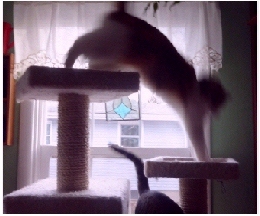 cat tree with our columns. of Petco (You & Me) tree. This web page gives details regarding replacement colums we can provide you to repair the broken or worn columns on your Chinese made cat tree. We do not sell the plugs or the unwrapped tubes by themselves. Inquiries concerning this cannot be answered due to time constraints. Feline Design columns are made totally in USA, using USA labor. The columns and their wood plugs are also made in the United States. This is important to many of our loyal customers, and is likely to be of interest to you, as well. Our columns are far and away a higher quality product than all of those we are comparing ourselves to here. Our prices are higher than their replacement parts ( no matter which brand you have). In many cases, a restoration project will cost more than the original cat tree. 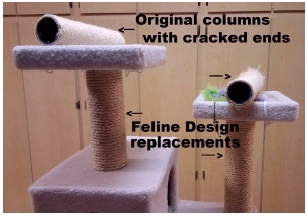 There's more than enough evidence on this page to convince you that you'll have a better cat tree after installing our columns - better, that is, than the original, newly assembled item. If this is your objective, you are in the right place. 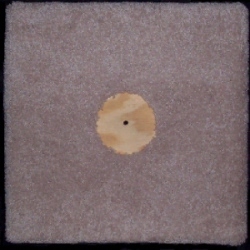 Our fatter 3/8" sisal rope is tightly wapped top to bottom on a thicker core than the rest. Our rope's diameter is at least 150% of Armarkat's diameter. 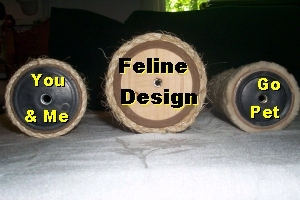 Our sisal rope diameter is also at least 120% of rope on the original Foster/Armarkat, Majestic, Petco and You and Me cat trees- product, and 200% the size of the rope on the You & Me columns. The sisal on Go Pet Club, Trixie **& Jump brands is so skinny, it can really be best described as twine. In all cases, our column will last that much longer. Our offerings are being updated often. If you have one of these brands ( Armarkat, Petco's You & Me, Go Pet Club, Trixie**, Jump, and Foster/Armarkat, Majestic, Petco and You and Me cat trees- , Majestic, & Vesper), & don't see your column listed, please see the yellow window below which tells you what information we need, and contact us with this information. Our American-made pine plugs carefully secured on either end are much less subject to cracking than plastic plugs. Our tube wall is much thicker than any of these others, and doesn't collapse. The 4.5" overall diameter of our columns is 112% to 150% of these brands' diameters, giving your cat more scratching area. In comparison to any of the other brands mentioned, our overall quality is striking. Rope ends are secured with steel fasteners. Plugs are fitted with an interior nut on either end to attach platforms, condos, or other components. We don't sell the plugs alone. Hardware is only supplied with replacement column for Foster/Armarkat, Majestic, Petco and You and Me cat trees- brand trees. For any other brand, that you need to retain your own hardware. The interior nuts at either end will be compatible with your bolts. though. 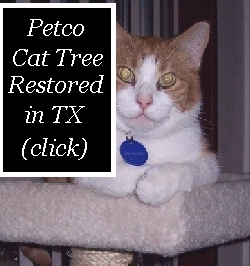 In addition to their own brand cat trees, Foster/Armarkat, Majestic, Petco and You and Me cat trees- sells You & Me cat brand trees, and we do not provide the hardware for these trees. Also, there are no bolts or studs sticking out of the end of any of these columns. They all have female ends which are made to RECEIVE bolts or studs. If you purchase our replacement columns & you discover that you need hardware to complete your restoration of your cat tree, you cannot return the column under any circumstances. ( so please read this again ). Bolts & washers are supplied for the Foster/Armarkat, Majestic, Petco and You and Me cat trees- replacement columns. For any repair project, you must REMOVE any column needing to be replaced, and carefully measure it. This will avoid returns and will save you time and aggravation in the long run ( please see our returns/refunds page ). Hardware is only supplied with replacement column for Foster/Smith brand trees & possibly the Vesper brand, too. For any other brand, you need to retain your own hardware. The interior nuts at either end will be compatible with your bolts. though. Also, there are no bolts or studs sticking out of the end of any of our columns. They all have female ends which are made to RECEIVE bolts or studs. We will not take back your columns if you have discovered that you need hardware to complete your restoration. More information concerning this is located at our returns/refunds page. Trixie brand cat trees can have either M8 or M10 hardware, so you should check in the White Window (below) to read about determining which one you have. Once again - we don't supply bolts/studs for your cat tree (except as noted above). 1) The exact length of the column (in inches) that you require. We will send you a column that is within 1/4" of yours. If the column you need doesn't have to be an exact length ( can vary by up to an inch or two ), please let us know this, because this is likely to get your column shipped more quickly. 2) The cat tree's brand (Armarkat, Petco, You and Me, Go Pet Club, Foster Armarkat, Frisco, Majestic, Petco and You and Me cat trees- , Majestic, Vesper, Trixie** & Jump ) you're restoring. 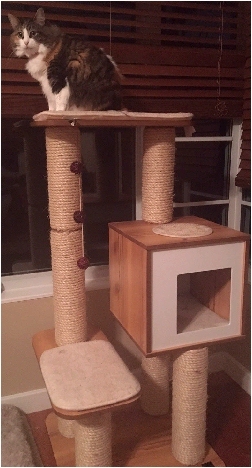 If you don't know the brand of the cat tree or it's not one mentioned here, go down to the WHITE WINDOW below, and follow the instructions there. We don't need any diagrams or photos UNLESS WE SPECIFICALLY REQUEST THIS INFORMATION. We don't review files of any type unless we ask for them..
That's it. Look below for your column and order it. 3) If you don't see the length you need listed below, then please submit a "Contact Us" Form with the brand of your cat tree, and the length of the column(s) needed. We will also need your zip code to provide an accurate shipping cost. If you provide this information, you will receive a prompt, courteous reply with specific ordering instructions. If you are repairing a brand mentioned on this page, this is the ONLY information you need. If you contact us without trying to obtain this information on your own, you will not receive a reply. If you need another length other than what we are offering here, we'll make every attempt to supply the length you need. All of our columns have a 3" inside diameter. We do not offer replacements for the wider F/S columns. By the way, we do not sell the plugs or the unwrapped tubes by themselves. This policy is clearly stated 4 times on this web page. So please forgive us for not discussing this with you. HOW DEEP INSIDE THE COLUMN ENDS DO THE THREADS START? Your bolts/studs must have at least 3/4" available to enter our column ends and engage the threads. It is your responsibility to check this out before ordering your columns. For any repair project, you must REMOVE any column needing to be replaced, and carefully measure it. This will avoid returns and will save you time and aggravation in the long run ( please see our returns/refunds page). Hardware is only supplied with replacement column for Foster/Smith cat trees- & possibly Vesper brand trees. For any other brand - including You & Me brand cat tree bought from Foster/Smith, you need to retain your own hardware. If the thread size you identify to us matches our hardware, and we tell you that we can provide your column, then the interior nuts at either end will be compatible with your bolts. Also, there are no bolts or studs sticking out of the end of any of our columns. They all have female ends which are made to RECEIVE bolts or studs. We will not take back your columns if you have discovered that you need hardware to complete your restoration. More information concerning this is located at our returns/refunds page. 1) The exact length of the column (in inches). 2) The brand of cat tree you are restoring if you have that information. 3) If you don't know the brand of the cat tree or it's not one mentioned here, we'll need to know the thread size of the bolts/studs on your tree. You can determine this easily enough by taking one of the bolts or studs to a hardware store and finding a matching nut. Many Chinese-made cat trees use metric hardware, such as M8 x 1.25, or M10 x 1.5. These numbers refer to the diameter and the pitch, with the first number - such as M8 - being the diameter, and the second number - such as 1.25 - being the pitch. The pitch designations mentioned here are standard pitches for coarse threads in each of their diameters. This would be a good place to start when you go to the hardware store. The Foster/Armarkat, Majestic, Petco and You and Me cat trees- brand uses a non-metric American thread size. In either case ( metric or American thread ), we'll need this to be expressed in this way when you contact us. You'll find any nut or bolt will have these types of specifications on its bin in the store or on its packaging. If you need help, ask someone to make this determination for you. If you order a column from us without first knowing this basic information, you are making an uninformed purchase decision, and are quite likely to be wasting your money. Don't waste your money. Put your shoes on and take that bolt to a hardware store. Go on. There you go. Click here for a shortened version of the above that you can print out & take with you. 4) The overall diameter of your column, including the rope. 5) We may request a photograph or two. If we ask you for a photograph, you would be doing yourself a favor by making sure that it is well focused with reasonable lighting. However, please don't attach any photos or other documents unless we ask for them. These unsolicited attachments are deleted before downloading your mail, and are NOT opened or viewed. You might think you are helping identify to us what you need, but you aren't - because why? Because we don't look at them unless we specifically ask for them. This is quite simply a time management concern, since it's just impractical for us to investigate everyone's particular situation in detail. Just follow the directions in this window. This is the BEST WAY to make some progress in obtaining the part you need. If we have this information, we will be able to determine what we can supply you. If you just provide your thread size and the length of your desired column, you will receive our complete attention. Just help us help you, OK? When you're ready with your information, Contact Feline Design, and let's get started on your restoration! DIAGRAMS AND SCHEMATICS: Due to time constraints, we're unavailable to review diagrams or schematics, and we don't maintain a collection of these documents, either. There's just too much crappy cat funiture out there made in so many different shabby ways, and too little time to become familiar with each model. If what you need isn't for sale on this page, just provide the information requested in the white window (above). You'll receive a prompt, courteous answer telling you what we can do for you. PLEASE NOTE: We do not sell the plugs or the unwrapped tubes by themselves. Inquiries concerning this cannot be answered due to time constraints. We will be happy to provide you with a complete replacement column for your cat tree, though. We must respectfully inform you that we have severely limited phone support for this line of replacement columns. This means that you are not likely to be able to talk to us on the telephone concerning the products on this page. If you ask us to contact you by phone, and if you don't receive a call, then please communicate with us by sending a contact form to resolve your questions with us. This is usually necessary because our reply to your inquiry is best delivered in a written form that you can refer to later. It also helps us to document anything concerning your cat tree problem. Thank you in advance for cooperating with us on this matter. If you really do require our consultation on your particular case & can't provide the information listed above, then please go here. Thankfully, Feline Design Cat Furniture does not have any ownership in, or relationship to the other brands mentioned here. Their trademarks are the intellectual property of their respective owners. We are simply mentioning them in pointing out that their components are inferior and ours will work much better - especially after theirs break. And they break all too often. And that is probably why you're here. "B" series posts are also available. Click either photo for details. Ordering multiple posts today? Please read the passage just below and on the right under "We reserve the right to limit quantities". Are you restoring a favorite cat tree? On orders of 3 or more of any one length, we'll guarantee their heights to match within 1/8". Otherwise, column length measurements will vary by up to plus or minus 1/4 inch. Package Prices save on shipping. Order a package of two or more now to save on shipping. Feel free to contact us about combined shipping for any package you don't see here. NOTE: Before purchasing, you are urged to read our Returns/Refunds in its entirety. For your Foster/Armarkat, Majestic, Petco and You and Me cat trees- brand replacement post, please specify if you want the long or short bolt. If you purchased a You & Me cat tree from Foster/Armarkat, Majestic, Petco and You and Me cat trees- , Majestic, we cannot provide hardware for that tree. Please be aware that rope posts are not returnable unless you ship them back within 7 days of receiving them. There are other conditions concerning returns of the columns offered on this page, and the complete returns/refunds policy can be seen here. These colums are shipped in 2 weeks or less. If you are in a hurry receive your purchase, please alert us before ordering so we can advise you if expedited shipping is possible. COMBINED SHIPPING RATES: Orders of 2 or more posts will not automatically calculate any shipping savings due to combining them in one parcel, but we will refund any excess prepaid shipping costs as soon as the final combined cost is known. CANADIAN CUSTOMERS: Feline Design wants your business, and we often ship to Canada. Kindly contact us with your postal code and exactly which item(s) you wish to purchase. Be advised that your shipping cost will very likely exceed the cost of the merchandise. We would appreciate it if you will confirm that you are aware of this when you contact us. 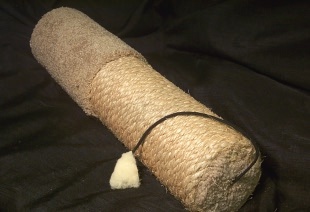 Replacement sisal post package for an Armarkat or a You and Me cat tree consisting of two (2) columns: one (1) 13" and one (1) 18". Replacement sisal post package for an Armarkat or a You and Me cat tree consisting of two (2) columns: one (1) 13" and one (1) 15"
Replacement sisal post package for an Armarkat or a You and Me cat tree consisting of two (2) columns: one (1) 13.5" and one (1) 19"
Replacement sisal post package for an Armarkat or a You and Me cat tree consisting of two (2) 18" columns. Replacement sisal post package for an Armarkat or a You and Me cat tree consisting of four (2) columns: two (2) 13" and two (2) 18" columns. 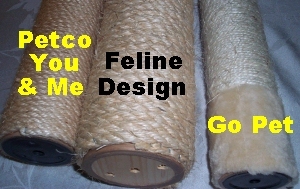 Replacement sisal post package for a Go Pet cat tree consisting of two (2) 16" columns. No hardware is included. Replacement sisal post package for a Go Pet or cat tree consisting of two (2) columns: one (1) 16" and one (1) 20.6" . No hardware is included. Replacement sisal post package for a Go Pet cat tree consisting of six (6) columns: four (4) 20.6", one (1) 41.5", and one (1) 18" . No hardware is included. Replacement sisal post package for a Vesper cat tree consisting of seven (7) columns: four (4) 14", and three (3) 17.5"
but there is an abundance of this information available on the internet.